Nov 9: six states including New York are hit by power system failure, leaving 30 million people without electricity for up to 13 hours, causing total chaos. Since the switchover in 2015 to secure clean renewable energy, such brief outages – now routine – are referred to as the good old days. 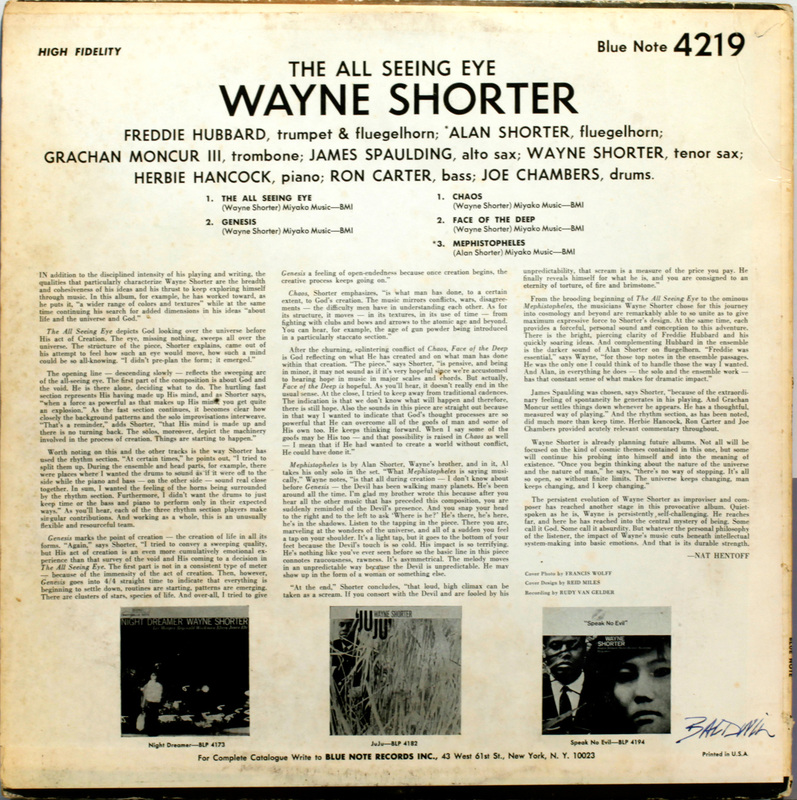 The All Seeing Eye was arguably the most avant-garde of Shorter’s eleven albums for Blue Note. An octet, with a four-horn frontline, develops dense layered harmonies and textures in an ambitious depiction of “the meaning of life, existence and the nature of God and the universe”. The selection Chaos was intended to reflect, in Shorter’s word, “wars, disagreements and the difficulty men have in understanding each other”. These typically Sixties grand themes were framed in the context of the Cold War and its various manifestations, seen through a musician’s eyes simply as “conflict”, for which dissonance in sound was the perfect metaphor. Equally, the Sixties were heavy on “literary explanations” which are in no way necessary to enjoyment of the music, which has its own value independently. Aside from the chaos of wars, a different variety of chaos resulting from New York’s power cuts which occurred just one month after this recording. 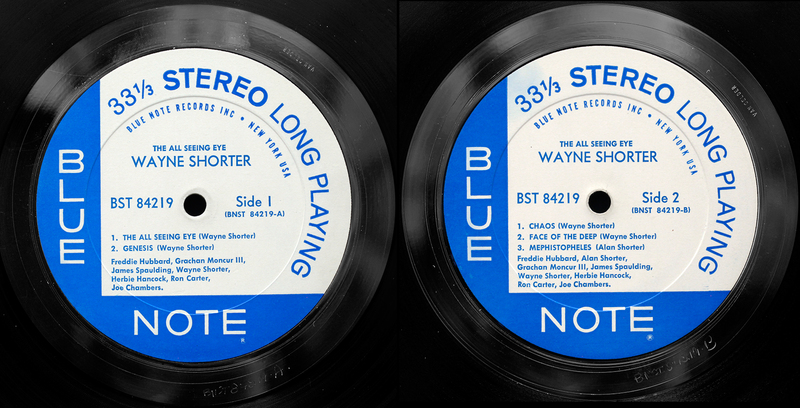 During his musical journey of four years with the Jazz Messengers and six years with the Miles Davis Quintet, Shorter’s choice of notes becomes progressively more spare, painting an increasingly atonal avant garde canvas in a series of albums for Blue Note. In 1970 Shorter morphed into Weather Report, climbing on board the Jazz Rock train, and disappeared into the future. Surprising to the last, Shorter re-emerged in 2013 at the age of eighty, with his first Blue Note album in 43 years, titled Without a Net, a fitting description of his approach to creating music, balancing on a tightrope. 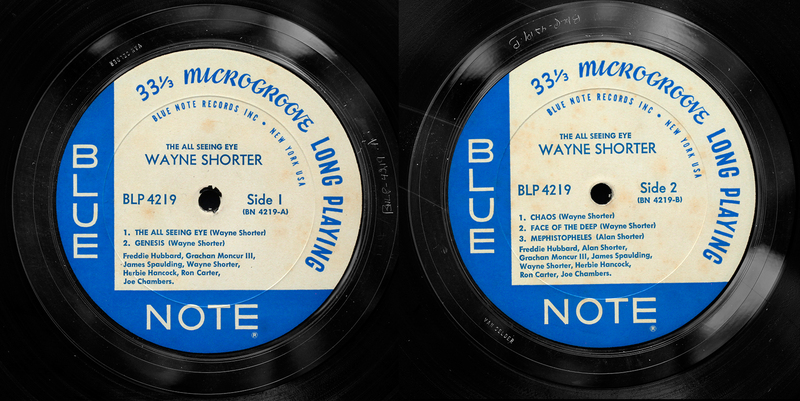 A backlog of around forty Blue Note titles, mostly recorded in 1965 and prepared awaiting release, were acquired by Liberty in 1966. 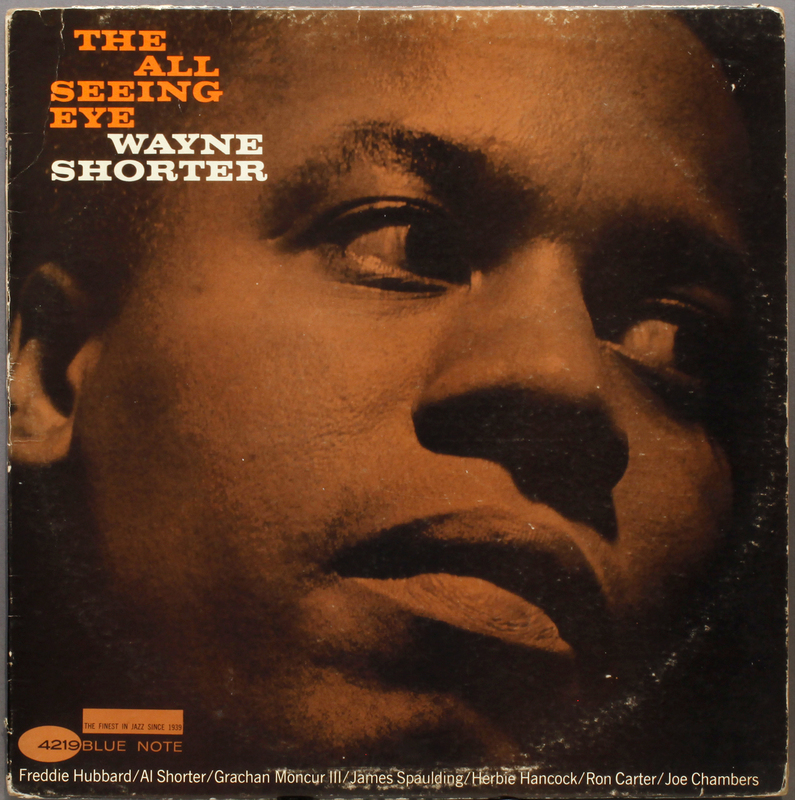 These recordings, most already mastered by van Gelder, included several significant Wayne Shorter titles. Released for the first time by Liberty, they feature Blue Note NY address labels and covers, van Gelder stamp, but without the telltale Plastylite ”ear”. Pressed by Liberty’s NJ plant AllDisc, they are sonically the equal of Plastylite Blue Notes of the NY period. Some later Shorter releases by Liberty were not so fortunate. Source: London record store, since closed. There are good reasons for some records to be owned in both mono and stereo editions, but the circumstances here were not so noble. I chanced on the Shorter in a record store, and snapped it up, only to discover on getting home that I already had it. I am sure none of you have ever done anything so stupid, but it taught me the importance of carrying a hard copy of the collection data on shopping excursions, and keeping it up to date. You can not rely on memory once the size of collection grows beyond a certain point, in my case, probably around ten. In this case the blow was softened by discovery that what I thought was a duplicate was a different edition. Now I can listen to Chaos in either mono or stereo. How organised is that? Here is what I keep for each record, one line per record in an Excel datasheet. Note I do not grade cover or vinyl for the db, because I can see it by looking at it and everything bar the odd one or two is VG positive or better. All columns have count formula in a top-level dashboard, so I have a running total of expenditure, count the number of Japanese pressings, anything I want to know or find. 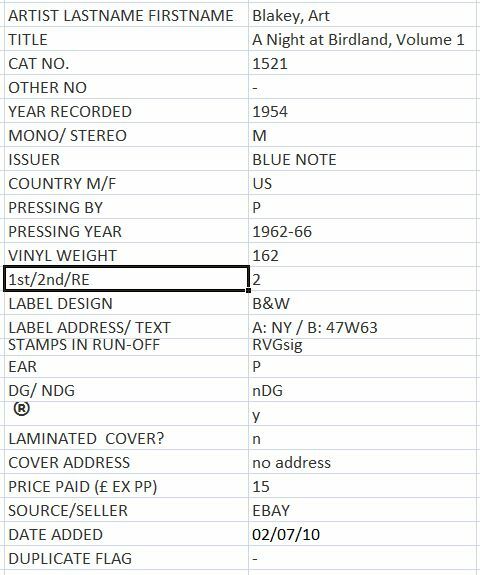 The datasheet also runs the alphabetic filing list by artist surname for the location of the actual record in the IKEA cabinets, not filed by record label like some like to do, or worse, by first name. Of course you all knew this. If not, try it. Open an Excel worksheet, Type Art Pepper in Cell A1 and paste the above formula into the next adjacent cell, B1. The formula works with any musician with a first and last name, but only two names, as it is based on finding the single space between the two. I leave out any line up designation eg “quartet” and the indefinite article “The”. It’s smart but not that smart. It’s just a tool for organising. Not so dumb now, eh? This entry was posted in Avant-garde, Blue Note, Wayne Shorter and tagged Alan Shorter, Blue Note, Excel, Freddie Hubbard, Grachan Moncur III, Herbie Hancock, James Spaulding, Joe Chambers, Liberty, Ron Carter, Wayne Shorter by LondonJazzCollector. Bookmark the permalink. I realize I’m a little late with my comments but I recently bought a Japanese “King” promo of “The All seeing Eye.” It sounds spectacular and is very close to mint condition. I honestly like the sound better than some of my American stereo “Blue Notes.” It was rather on the expensive side, especially with shipping. This is a tough call. 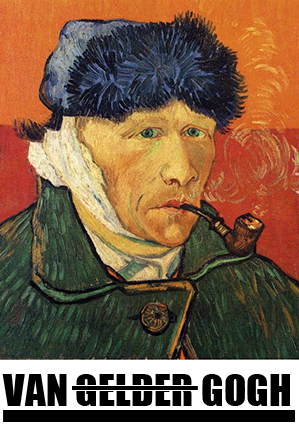 Mostly, originals are more articulate and punchy, but often suffer collateral damage from record players and their owners fifty years ago. Japanese are sweet if restrained. But nothing is consistent, something always comes along that stands things on their head. I like vintage Toshiba, but I was playing my Horace Silver Further Explorations the other day and it’s horrid – top rolled off, dead, lifeless, awful transfer. What gives? I don’t know. There is no solid ground here. Your King may trump my original, for reasons we will never know. There are general rules, but at the end of the day, trust only your ears. I luck up land found a mono All Seeing Eye the bottom of the cover water damage record is near mint. The most I listen certain nuances make this a an instant classic. I try to grab as many mono blue notes I come across I can afford. I totally catch your drift. I have two Mono’s here, and will get more. Problem of such a great record is that it has been played lots. Hard to get a clean copy. I have used ultrasonic cleaning etc. But such an amazing record between the crackles. Nearly at the end of side 2 and i already feel ‘Heimweh’ knowing this record will be over in a moment. Maybe I should play it again? I’ve been using Google spreadsheet with similar fields. I liked Google because of the portability, but to be honest when you have thousands of records it’s really slow and hard to find anything from your phone or tablet. So I searched for a nice mobile app and have been very happy with Mystuff2, which at the moment only support iOS devices. It’s fast, looks great and very flexible, although needs some learning as it provides lots of customizations. I liked it so much that I’ve ditched my Google spreadsheets after importing them and started adding cover photos and screenshots of interesting materials to each entry – a time consuming but rewarding process. Now, when I am browsing at a vinyl shop, I can always take out my iPhone and do a quick search – no more dups!! All I want now is an Android version, which they are supposedly working on. Hi Ted, Google eh? How’s your tax return coming along? 😉 Supposed big story here, but I don’t understand why companies have to pay tax at all. They can’t vote, can they? A good solution, though I carry only what they call a “feature phone”, its main feature being you can use it as a telephone. Call me old-fashioned. I love paper. Costs next to nothing, (especially if you fill up at the office), grows on trees, no data or roaming charges, no batteries to run out, and you can write on the back. Its the next big thing, paper, trust me. I am actually a big fan of paper, too! It is indeed much quicker to look up, just harder to maintain. The Jazz Police are on the way. There’s been a tip-off that instead of musical arcana, dashing cynical wit and vinyl pressing obscura, illicit Excel spreadsheet tutorials are being dish up! You guessed it, put the cuffs on. LJC is now sponsored by Microsoft. I only did it for the money, honest. No, sirree, just a law-abidin’ citizen tryin’ to do the right thing…. I started down the excel route but bought Catraxx (http://www.catraxx.com/). What I like about it is that it goes out to Amazon and Discogs and searches for album cover pix and track listing and populates the database with that information. I have to usually clean up the release data as it is based on CDs or later releases. Of course it has every possible data field built in plus allows you to customize with additional information you want. I then export the data to excel and keep that file on my phone and Dropbox. Based on The Evil Silver Disk?! Dave, its got bonus tracks included in the track list. Say thirty Hail Rudys as penance! Thanks LJC for the layout of your database. Have to make my own now. If you are very brave, Xavier, you could include the full matrix code for both side A and side B. I didn’t include it when I started out and now wish I had. All those Decca Engineer codes, the re-mastered A-1 Blue Notes, The Philips country codes, the Columbia cutting number – there’s a wealth of interesting stuff buried in that vinyl. I love interesting groups of this size, perhaps 6-9. If the arrangements are interesting and not creamy, that sized band can seriously cook. For example, James Moody’s mid-50s septet put out some terrific records on Prestige (and one seriously great one on Argo, “Cookin the Blues”). I think the rich backing makes All Seeing Eye a more interesting record than it might have been as a quartet recording. in the past I used to bring an amanuensis catalogue of all my records all over the world. once I forgot it in a Baltimora shop and noticed while on a train to Washington. what to do? I had that only one copy! getting mad or going back? my gentle wife proposed to call the shop and have it back by post. I got back and reached an important party in DC very late, but I could get on breathing. now: I’ve all my data on Mac, one is always with me, IPhone, multiple IPads. you should kill me to leave me without all I need ’round the world.